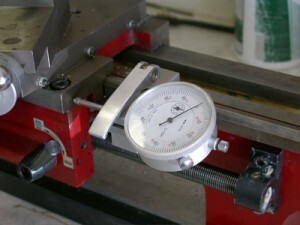 SwarfRat Enterprises has a set of free plans for a quick-release dial indicator holder that mounts on the front of a mini-lathe. The holder is made from a 5-inch long piece of .875-inch square aluminum stock. It also uses a quick-release lever from a bicycle seat or wheel that can be purchased inexpensively or salvaged off an old bike. It looks like it should be fairly easy to make, although it will require a mill. I am thinking about making one but not to use with a dial indicator. With a little modification it might make a great carriage stop, much better than the one I’m using now. For those rare times when I need to measure the movement of the carriage I use a dial indicator with a large magnet mounted on its back. It’s easier to make and I can also use it on my mill, which makes it a really useful tool. SwarfRat also makes instructional videos that will show you how to use a mini-mill or mini-lathe, how to repair them, and how to use some tooling like a rotary table. You can buy them at their web site. SwarfRat also rents them for about $9 a week. That seems like a pretty smart move because there’s another company becoming well known for the how-to videos they specialize in renting. That company probably buys just one or two copies and keeps renting them out. My guess is that all those rentals destroy the sales of the companies that invested time and money to produce the videos and removes the incentive to make more videos we might be interested in. But for some strange reason SwarfRat does not rent all of their titles, only a few of them. And I’m disappointed because they don’t rent their video about the rotary table, which is the one I would really like to see because I just bought one. They also don’t provide any sample videos and I can’t find any reviews of their products. So I’m not going to be taking a chance and spending $44 to buy a copy.